District of Columbia health regulators ordered a D.C. hospital to stop delivering babies after several dangerous choices by hospital staff put patients at severe risk. United Medical Center had its license to deliver babies and operate a NICU (neonatal intensive care unit) restricted because of several dangerous events, according to the Washington Post. One of the reported instances involved failing to prevent HIV transmission from a mother to a newborn, apparently not screening properly, and a complete failure to treat the baby with antiretroviral medications at birth. This is particularly disturbing because the transmission of HIV is preventable and the screening, assessment and treatment for the baby are well-established patient safety rules. By well-established, we mean that this has been the standard of care for at least 25 years. Standard of care is the rules hospitals and doctors follow to keep patients safe. We have represented many children with birth injuries like cerebral palsy, but it has been many, many years since we have had a medical malpractice case involving the transmission of HIV from the mother to the baby in D.C. This is because the transmission of HIV is preventable and the treatment is so well-known and established. Another documented violation of the rules involved a patient with preeclampsia, a potentially fatal high blood-pressure condition in pregnant women. It's pretty clear there is a system failure at this D.C. hospital; and hopefully the District health regulators caught this and acted in time to prevent harm to patients. Unfortunately, the District and the hospital are not releasing any information voluntarily - again putting patients at risk. If you were going to the hospital wouldn't you like to know about medical mistakes so you could know what to ask, what to look for to keep yourself and your family safe? The D.C. Department of Health and hospital management aren't talking or disclosing any of the safety violations (and how they plan to fix them). But thanks to the Post for uncovering this important information and hopefully making a D.C. hospital safer. 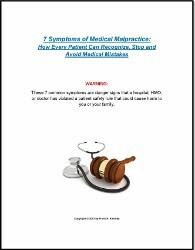 If you're going in to the hospital - any hospital - take the time to order our free guide 7 Symptoms of Medical Malpractice. This guide offers information you can use to recognize and prevent medical mistakes before they happen to you or a loved one. The guide is free and you can click on the image or call us at (202) 393 - 3320 to order your copy. And get help for a child with cerebral palsy by ordering one of our free guides or resources. Get started today by filling out our confidential, no obligation form or calling us so we can send it right out.